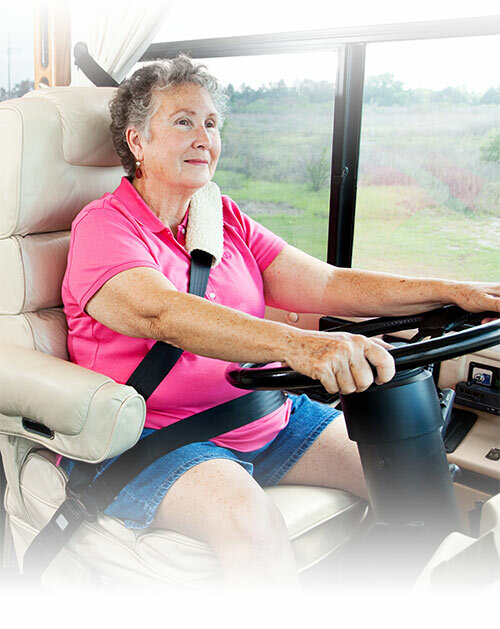 CLASS®, which stands for, Compressible Liquid Adaptive Suspension System, is a smart suspension system for ambulances, shuttle buses, RVs and military vehicles. Liquid­‐based struts and an on-­board processor provide better handling and control when you need it, and a smoother, softer ride when you want it. The reduced vehicle vibration increases comfort and lowers maintenance costs. CLASS® automatically and instantaneously changes the spring stiffness and damping at each individual wheel in response to road and driving conditions. When the road’s rough, the ride is soft and smooth. When the vehicle makes sharp turns, corners, or emergency evasive maneuvers, the suspension stiffens to provide superior stability and eliminates roll. Thanks to the on-­board processor, the suspension adapts and makes adjustments without driver intervention for a fluid, seamless experience. Seamlessly, without driver intervention, automatically, and instantaneously provides a very soft spring or a very stiff spring with associated damping as needed for road and driving conditions. Automatically load levels chassis compensating for imbalance and variations in vehicle payload distribution. Pump only operational while load and chassis leveling thereby consuming minimal power. User-friendly driver interface with graphic display for drive and diagnostic modes to integrate system control and chassis leveling while providing means for troubleshooting system. 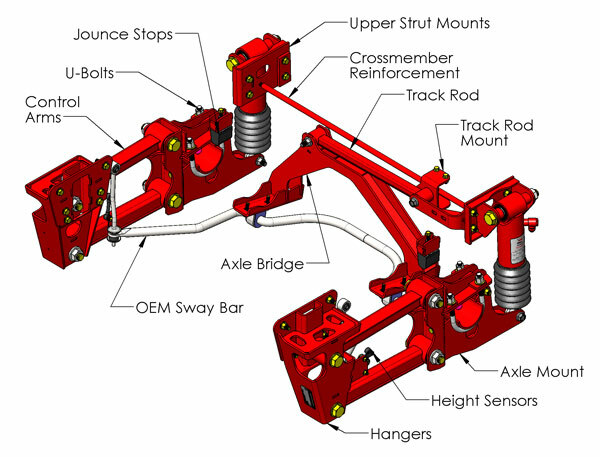 CLASS® uses an optimized 5-­link suspension configuration, struts with a compressible fluid as the spring/damping medium, and a sophisticated on‐board microprocessor to monitor driving conditions. This microprocessor acts as the suspension systems’ brain and allows for automatic and instantaneous change of spring stiffness and damping at each individual wheel. This provides the ability to reduce ride harshness while increasing roll and pitch control. CLASS® monitors and processes various vehicle signals and motion at each wheel via its ECU and instructs each corner strut to change its stiffness and damping characteristics as required to minimize power transmitted from the suspension to the chassis while maintaining body control. The strut stiffness and damping characteristics are dependent upon its effective fluid volume. CLASS® incorporates a rate valve between the strut and the secondary volume. The rate valve controls the interaction of fluid between the strut and secondary volume, thereby managing the effective fluid volume. 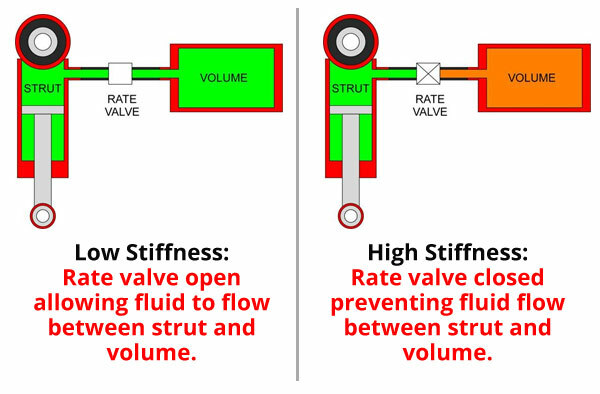 As shown above, when the valve is completely open, the strut exhibits its lowest stiffness. When the valve is completely closed, the strut exhibits its highest stiffness. The valve is proportionally closed to cause the strut to exhibit transitional stiffness and damping. The suspension is a 5-Link non-torque reactive design that maintains proper driveline angles throughout the range of travel which minimizes driveline noise, vibration, and fatigue. The jounce travel of the suspension provides for compliance with Federal Specification KKK-A-1822 for rear floor height requirements when the “kneel” feature is used. Installation does not require modification to the O.E.M. exhaust system and its capacity rating matches the O.E.M. rating. 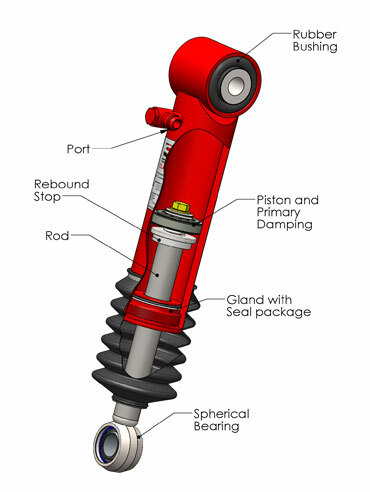 The strut is fairly similar to a conventional hydraulic cylinder except the rod and non-rod chambers are equally pressurized and separated by viscous damping elements. The internal strut fluid pressure is proportional to the external load applied to it. The extension/retraction of the strut is detemined by adding/subtracting fluid volume (at pressure proportional to the external load) equal to the amount of rod volume to be displaced. An integral rebound stop is built into the strut and it is pre-filled for installation. The 2nd fluid volume is a pressure vessel mounted to the chassis frame. 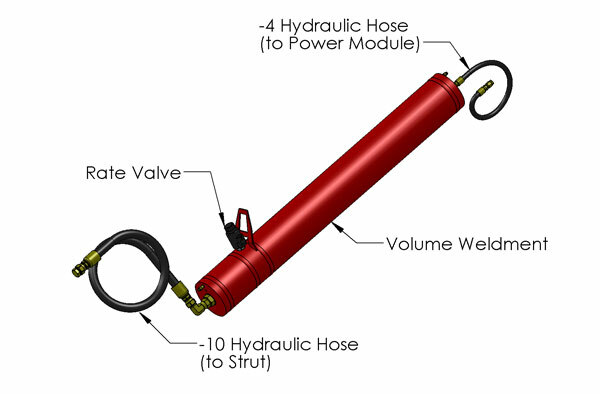 It is connected to the strut via conventional hydraulic hose and fittings. Bleed screws are provided to remove any entrapped air that may enter the system during installation. The 2nd volume is pre-filled for installation. The power module integrates the pump, motor, manifolds, control valves, filters, low pressure reservoir, and ECU and is mounted to the chassis frame. 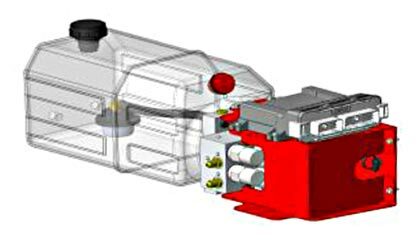 Industry standard hydraulic and electrical connections are used to interface it with the system. 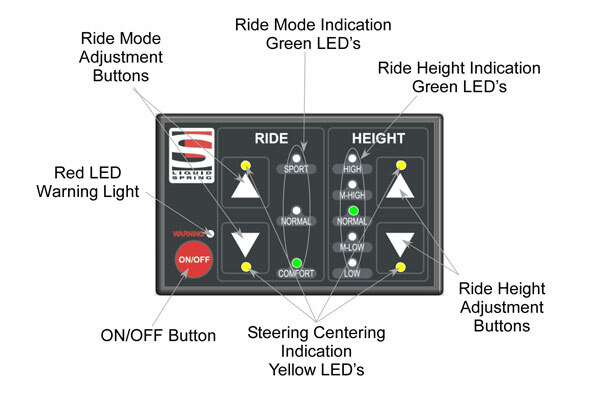 The driver interface provides a means to adjust ride modes, change suspension heights, and notify the driver of system issues via a red warning LED. Troubleshooting system problems can be facilitated with the diagnostic codes illuminating various LED’s. The system can also be enabled/disabled via the On/Off button on the driver interface.